$1 Million Pledged! Only $212,999,000,000 to go! 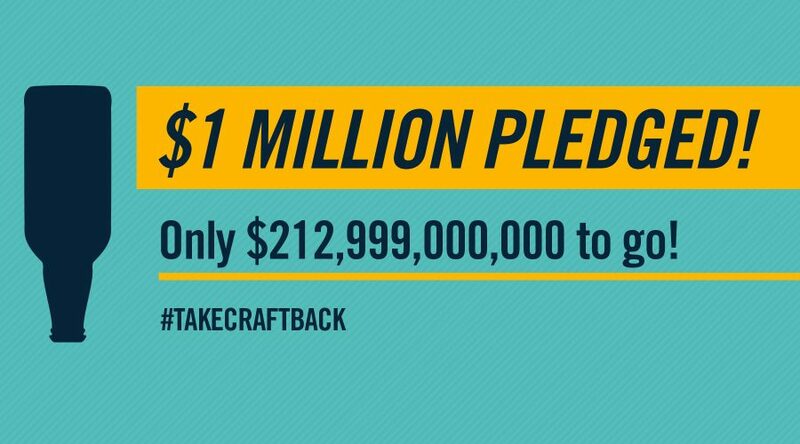 October 16, 2017 By Lara in News from Take Craft Back Comments Off on $1 Million Pledged! Only $212,999,000,000 to go! Can you hear that, Big Beer? That’s the sound of pledges rolling in. Take Craft Back has raised a million dollars in pledges so far! And that’s only so far! Thank you to all of our dedicated, companionate, digital-savvy pledgers for supporting independent craft beer and independent craft brewers. Now, let’s go get the rest of those couple hundred billion and Take Craft Back!